Do you still remember this work in progress that feels like forever will be WIP? I remember I started to cast on around 2 years ago while I just started learn knitting. After a few drop stitches I gave up. I wanted to rip it off once, I felt the yarn colors are a little bit weird. But my laziness won, too lazy to rip it off. 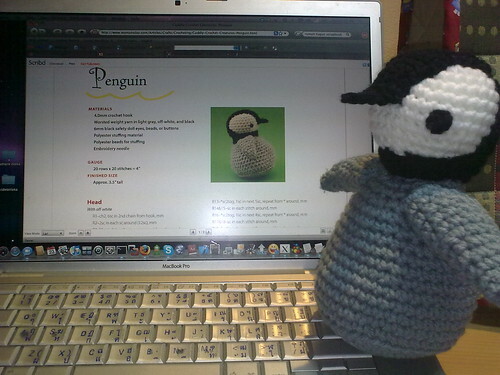 I changed my mind and just continue to knit it once a while and this is how it looks on June 2009. Finally I did it. After almost 2 years, I cast it off and call it finished project. The shawl is not too wide but long enough. 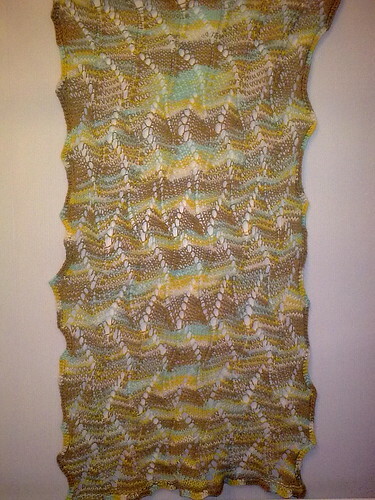 I am thinking to use it as a shrug-shawl. 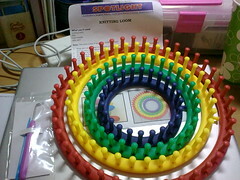 Recently I donâ€™t have a lot of time to do crafts. 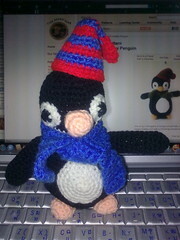 Amigurumi is still the best choice for me. Itâ€™s quick and thereâ€™s no need to be perfect in following the pattern. It also donâ€™t need huge amount of yarn. I can use my extra yarns and when I donâ€™t have the instructed color I can always replace it with what I have in my stash. I never thought I will try some amigurumi crochet until I saw a lady in the coffee shop in our office building who make different dolls everyday. 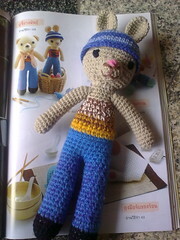 I remember there are some amigurumi patterns in Thai magazine that I buy every month. 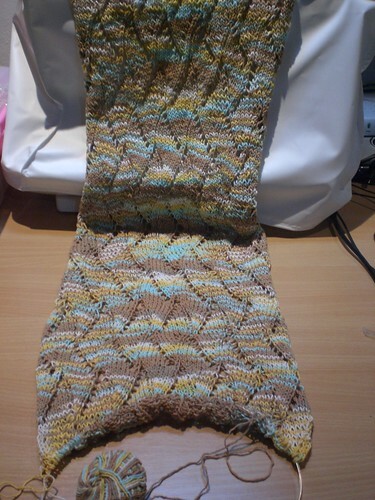 So I chose the pattern that I thought will be easy enough for me and it surprised me I can do that in a short time. 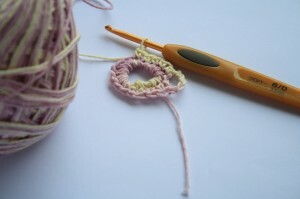 Making the body parts is easy, to put it together is harder than to crochet the parts. 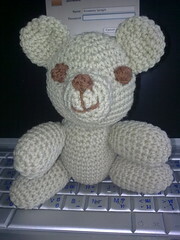 My work is not quite neat yet, and it made me want to make another one short after I finished the bear. I picked the bunny for my next project. The pattern still from the same magazine. I can do this while I’m watching some tv series. 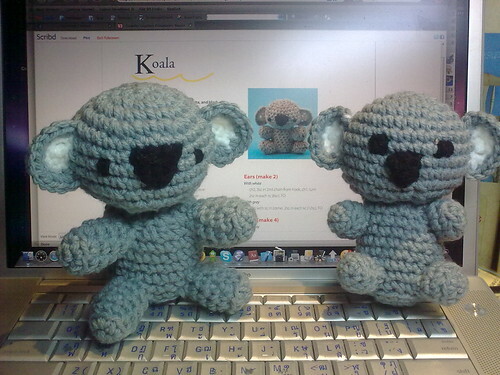 I think I will make more amigurumi for a while. Many things happened in my life in the past few months. 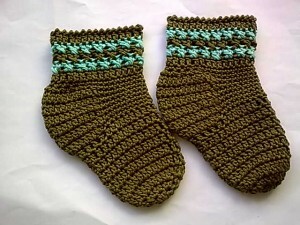 I made baby socks and follow the mystery scarf CAL to get back to my hooks and yarns. For the baby socks pattern I got from my friend who got it from free pattern somewhere. 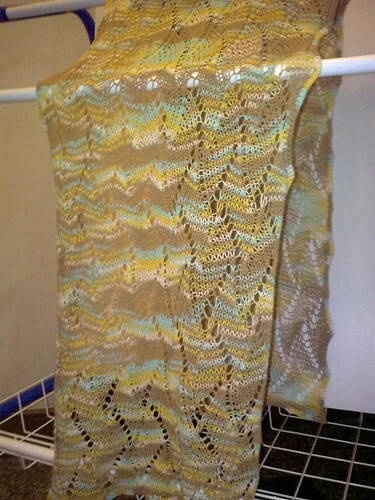 More info about the mystery scarf crochet along is on goggle groups. 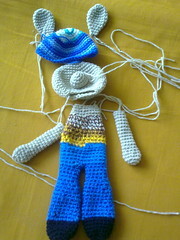 It feels good to be back :-), can’t wait for the next stage of the mystery scarf CAL. Since I fell in love with needle and yarn, I’ve been wanting to have a store with many yarns and needles in it.. Well.. finally I started an online shop with my friend. Our main target customers is in Indonesia. My Friend is also a yarn lover, she started playing with needle and yarn almost at the same time with me. 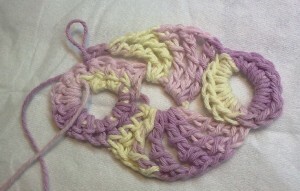 Yesterday one of the Crochet Partners member asked about Thai Crochet Stitch. I remember that I learned that stitch from my masseuse. But I just realized that the shape of the flower was different. 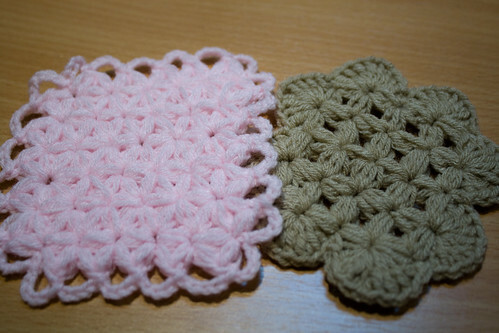 The one that was uploaded in Crochet Partners have 4 rays while the one that I learned before has 6 rays.